Deep Drawn Metal Stamping competes with many other types of manufacturing processes that create the same or similar products. The Deep Draw process does however have several significant differences that set it apart from other methods. The choices are sometimes confusing, and many manufacturing experts may provide advice for those who are considering the deep drawn metal stamping method as an alternative. While their intentions are always good, sometimes these tidbits of knowledge can be a bit off-the-mark. 1. The costs are just too high. Simpler methods are cheaper. Not true. Deep draw is a continuous process, making it one of the fastest and most cost effective methods available. With the deep draw process, the cost per part actually decreases as the number of parts produced goes up. 2. Deep drawn stamping is only for simple parts. Absolutely false. Deep drawn metal stamping can create parts with extremely complex geometries to very tight tolerances. 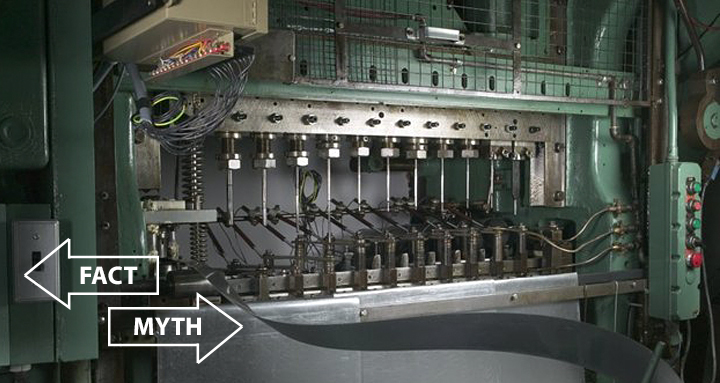 Multi-station stamping presses are capable of forming axisymmetric parts that are seamless, strong, and light. 3. Deep drawing weakens the material. This one is almost understandable, but still false. A common misconception may be that the deep drawn process stretches the material, and therefore certainly damages or cracks the metal. In reality, the forces introduced to the material only serve to increase the overall strength through a process known as cold working. The material is formed under pressure to a specific shape. While some elongation may occur, actual stretching of the base material is very slight. In the end, the finished part is actually stronger than the original material. 4. High tech means high operating costs. Wrong. From an operational standpoint, deep drawn metal stamping is one of the simplest and most robust processes available. High uptime and low technical labor costs combine to make the deep drawn process easy and profitable to manage. There may be more myths and bad advice out there, but this list captures the top four. As with any advice from any source, it always pays to do your own research. If you can think of any more common misconceptions we didn't cover, let us know in the comments!